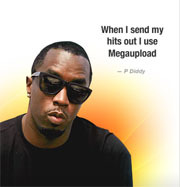 Earlier today, Megaupload released a pop video featuring mainstream artists who endorse the cyberlocker service. 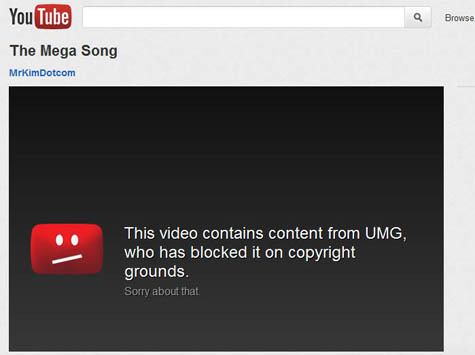 News of the controversial Mega Song even trended on Twitter, but has now been removed from YouTube on copyright grounds by Universal Music. Kim Dotcom says that Megaupload owns everything in the video, and that the label has engaged in dirty tricks in an attempt to sabotage their successful viral campaign. This morning we published an article on a new campaign by cyberlocker service Megaupload. Site founder Kim Dotcom told TorrentFreak he had commissioned a song from producer Printz Board featuring huge recording artists including P Diddy, Will.i.am, Alicia Keys, Kanye West, Snoop Dogg, Chris Brown, The Game and Mary J Blige. These and others were shouting the praises of Megaupload. By this afternoon #megaupload was trending on Twitter as news of the song spread. Little surprise interest was so high; Megaupload is described as a rogue site by the RIAA and here are some of their key labels’ artists promoting the service in the most powerful way possible – through a song. And then, just a little while ago, the music stopped. Visitors to YouTube hoping to listen to the Mega Song were met with the following message. TorrentFreak immediately contacted Kim to find out what was happening. So did Universal have any right at all to issue YouTube with a takedown notice? Uncleared samples, anything? TorrentFreak spoke with Corynne McSherry, Intellectual Property Director at EFF, who says this type of copyright abuse is nothing new. “This appears to be yet another example of the kind of takedown abuse we’ve seen under existing law — and another reason why Congress should soundly reject the broad new powers contemplated in the Internet Blacklist Bills, aka SOPA/PIPA. “If IP rightholders can’t be trusted to use the tools already at their disposal — and they can’t — we shouldn’t be giving them new ways to stifle online speech and creativity,” McSherry concludes. Sherwin Siy, Deputy Legal Director at Public Knowledge, worries that this type of sweeping power would only be augmented with the arrival of the SOPA anti-piracy bill in the US. “If UMG took down a video it has no rights to, then what we have here is exactly the sort of abuse that careless, overzealous, or malicious copyright holders can create by abusing a takedown law,” he told us. “What makes this even worse is that UMG, among others, is pushing to expand its power to shut people down by fiat–SOPA lets rightsholders de-fund entire websites with the same sort of non-reviewed demand that removed this video,” he concludes. Megaupload’s Kim Dotcom informs us that he has now submitted an international counter notification to YouTube, informing them that UMG has no rights to anything in the video and that the label abused the YouTube takedown system to sabotage the company’s business. “It’s ridiculous how UMG is abusing their intervention powers in YouTube’s system to stop our legitimate campaign. They are willfully sabotaging this viral campaign. They own no rights to this content,” Kim insists. Streisand Effect, here we come again. c There are 274 comments. Add yours?